Congrats! 2016-2017 Lieutenant Governor: Carmen Awin-Ongya! My name is Carmen Awin-Ongya and I am honored to be the next Lieutenant Governor. Most of you don't know me so here are some things about my life that I would like to share. 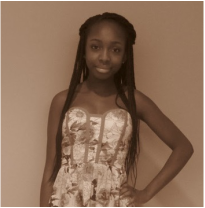 I was born on December 13 1998 in Italy as the second daughter to Ghanaian immigrants. In late 2001 I came to America, but prior to that my sister and I spent almost a year in Ghana with our grandparents. So I'd been on three continents by the time I was three. After that I become less mobile. Living in Bolingbrook until the middle of kindergarten, then moving to Romeoville where I have been ever since. I am currently a junior at Romeoville High School where I take the most vigorous courses available in preparation to attend one of the nation's top universities (so I hope) and participate in multiple extra curricular activities. As the next Lieutenant Governor I want each individual Key Club to be successful and as whole for the division to be successful and hopeful expand in number of active of clubs. Previously stated in my election speech, creating a sense of unity between the clubs in this division and being as efficient as possible are two critical goals of mine. In accomplishing these goals I want to promote more inter-divisional service projects and events, where neighboring Key Clubs will be able to work together. Also, I want to employ either interactive apps, websites, or social media outlets for communication and efficiency purposes. Overall, I want there to be a sense of community and family in Key Club created by the bond of serving others.